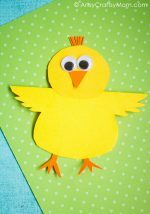 This Easy Easter Bunny Paper Craft is fun for kids of all ages. 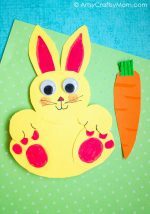 You can use the Easter Bunnies to decorate your house or classroom, as large puppets (attach a wooden spoon to the back with strong sticky tape), or as masks. 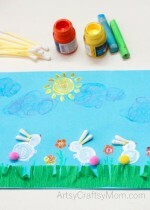 With Easter just around the corner we are switching gears here now and focusing on Easter crafts! 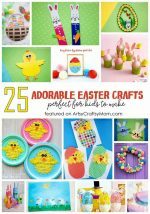 I am pretty excited to share some of the Easter crafts I have in store for you guys. In the past I haven’t really done many Easter crafts so this year will be packed full with new stuff! Start by cutting out two 8-inch circles for the face. Then 2 ears about 5 inches long as shown in figure below. Cut eyes & ears from white construction paper. And some teeth & don’t forget the whiskers & cheek dots. Paste the ears between the two circular face cutouts using a glue stick. Now stick on the eyes, the ears & whiskers. Using black markers draw the eyes. Finally add a matching pom pom for the bunny’s nose. Aren’t they the cutest? 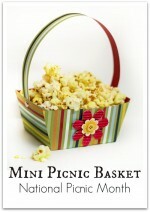 It really is that easy to make them and don’t they look oh so adorable! You can make a whole family or burrow full of rabbits and enjoy some imaginary play. What an easy lesson on how to make an Easter bunny. It is always amazing to me that simple craft supplies can be transformed into something cute and creative in a matter of minutes. Take these paper bunnies for example. They are made of a pastel construction paper and glue. It didn’t take long to transform those objects into bunnies that will brighten our craft room for the month of March.